Sometimes the best foods can be found not in an expensive restaurant, but in small hole-in-the-wall places. So goes true for the Kati Roll Company located in Greenwich Village and Midtown, NYC, as well as in London’s Oxford Circle area. The Kati Roll Co. brings Indian street food to your fingertips. Originating in the streets of Calcutta, India, the kati roll is a warm paratha, wrapped around tenderized, marinated meats, cheese, potato or egg. As with most Indian food, the spice factor can be altered to your liking. My most favorite kati roll is the paneer (cheese) kati roll. 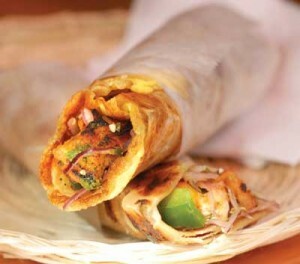 The warm paratha (indian flat bread) wrapped around slightly charred paneer, onions and chilies is a foodies delight! The atmosphere of The Kati Roll Company will bring nostalgia to people who have grown up in vibrant india. As you approach the restaurant in Greenwich village, you will most likely see the line going out the door with hungry students and professors waiting to get their lati rolls. The walls are painted with bright colors and lined with posters of old Indian films while melodious music of Hindi films from the 1940′s plays in the background. If you are looking for great ethnic food in an even more ethnic atmosphere, The Kati Roll Company is the place to be! This entry was posted on Thursday, December 23rd, 2010 at 2:51 pm and is filed under Food, Tasting the World in NYC.